After nine months of sitting shuttered by the City, after hopeful rumors that they’d soon be reopening, Chelsea’s wonderful La Taza de Oro has called it a day. 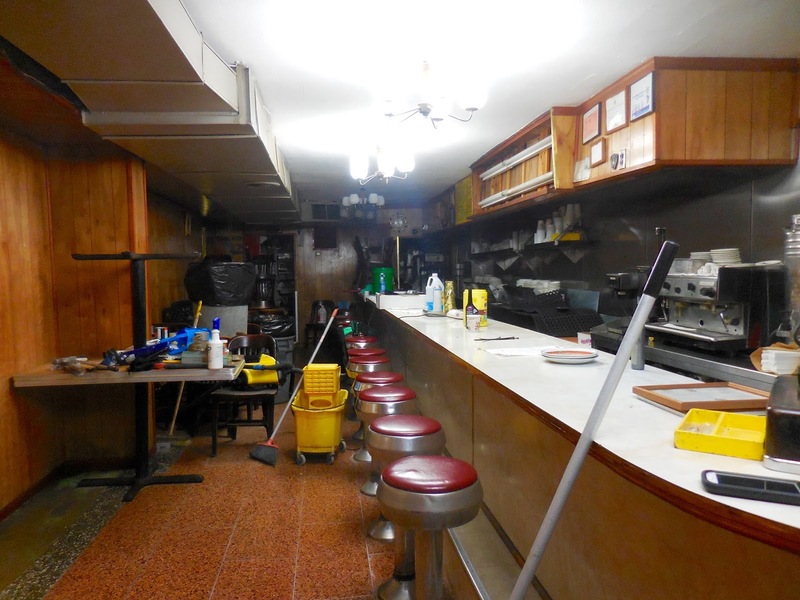 Sadly, it's been confirmed, the beloved 68-year-old Puerto Rican luncheonette has closed for good. I will miss it. A tipster wrote in, "They were looking forward to opening in January, and as of not that long ago were still going to open, but the city recently put additional financial burdens in the way that make it impossible for the small business to open back up." I went by the restaurant to find proprietor Eric Montalvo, husband of Maria and son-in-law of the man whose uncle originally opened the restaurant in 1947. Mr. Montalvo was mopping the floor, cleaning up the place and taking it apart. He let me inside and we talked awhile. The bright yellow hand-painted menu signs had already been removed, but he put them back up, proudly, so I could photograph and admire them. He told me he’s retiring. His children don’t want the restaurant; they all have careers of their own. 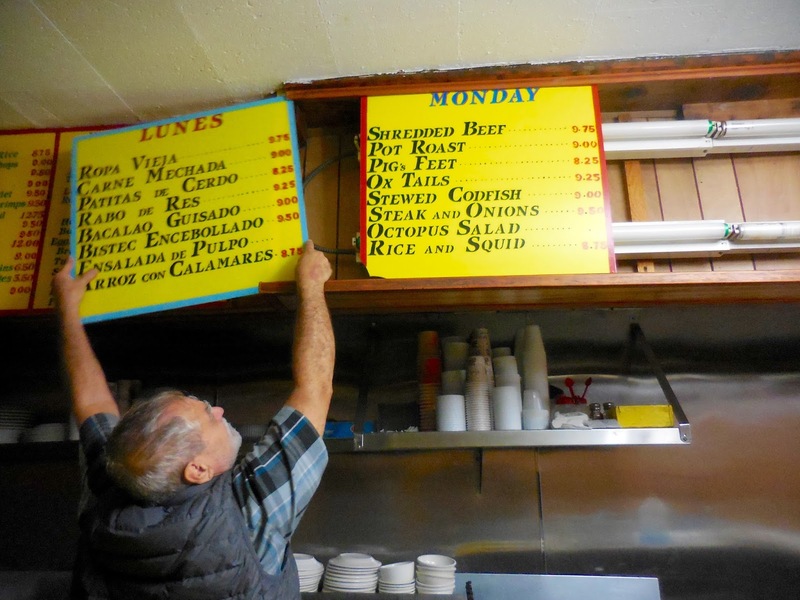 Even when you own the building, as the Montalvo family does, it’s getting harder for small restaurants to stay afloat in this town, thanks to increasing bills and a punishing Health Department. "Small businesses are being pushed out," said Montalvo. On top of all that, the neighborhood has changed dramatically in recent years. Google took over the building across the street, and its employees, by and large, don’t want the Puerto Rican home cooking at La Taza. “The new generation,” Montalvo said, “they walk around with the Starbucks cups and the cell phones and…like this,” he turned up his nose and clutched his collar to mimic someone who acts superior, Starbucks cup in hand. 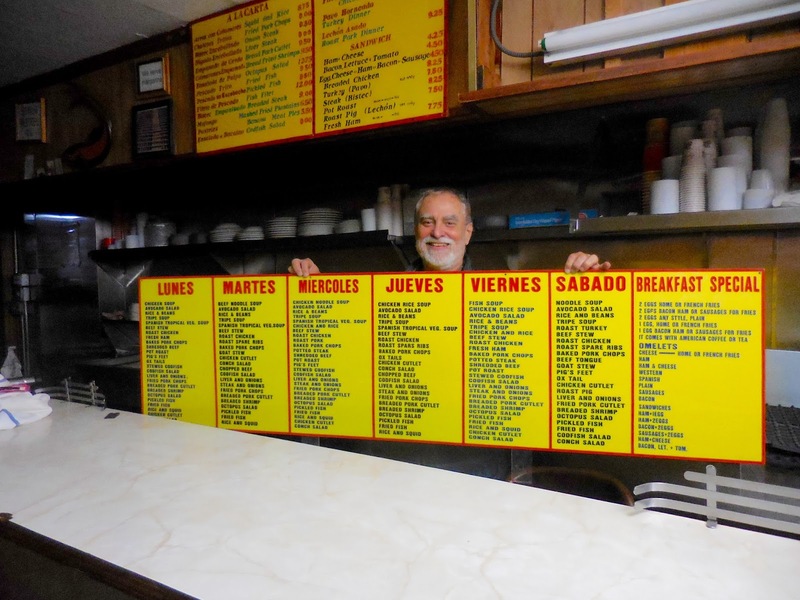 Through the years, La Taza soldiered on, a thriving remnant of the days when Chelsea was filled with Latin restaurants and people. It has served mofongo and tostones to many a celebrity -- Carlos Santana, Puff Daddy, Benicio del Toro, Madonna, Sandra Bernhard -- among the crowd of everyday neighborhood regulars who were devoted to this warm and comforting place. Montalvo understands that people will be heartbroken to see La Taza go. “I’m sorry to them,” he said. “This is a landmark of New York. It’s the embassy of Puerto Rican cuisine in the city.” But, at some point, you realize you're fighting a losing battle. Montalvo plans to rent the space out and hopes for a Latin restaurant to move in. As for those vintage hand-painted menu signs, he’ll be putting them on ebay if you’re looking for a souvenir. Better than Starbucks. And only $1.50. 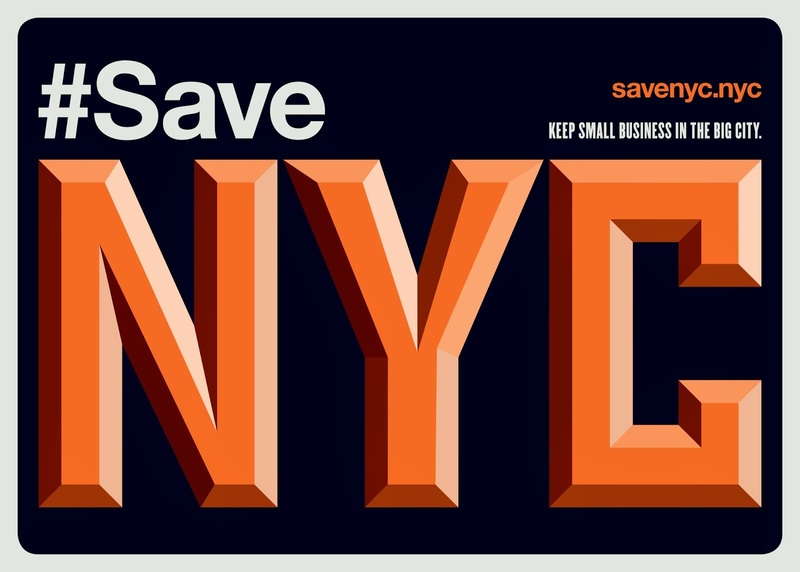 Business by business, New York's individuality and diversity is being erased. And there doesn't seem to be anyone in a position of power who seriously wants to or is trying to halt this transformation. Not one. Hasta siempre, La Taza de Oro! Always such wonderful service. Tasty dishes. Great value. These digs were one of the reasons I was able to survive as a young man in The City. They helped in keeping my belly full for cheap, and for nourishing my soul with the clatter and chatter of clients and employees alike. Very much like home. Will always remember and be grateful. As we say in Italian: Coraggio, a la prossima. This is, of course, punishingly sad. The neighborhood has lost Sucelt on 14th and 7th, and Cabo Rojo on 10th Avenue and 24th, and now Taza. I took my kids there every week. And what of all the jobs lost? Luis, Lucie, Reve, and so many others. And the impromptu art exhibitions on the walls. I saw Mr. Montalvo there a few weeks ago and, having noticed that he was painting the restored cornice yellow and red (like the rice and beans within!) I asked him when he was reopening and he said he was retiring. It is a miserable state of affairs, and so the last of the rice and beans joints vanishes into the ether. We will all miss La Taza de Oro. I'm very sorry to hear this. I used to work in the same building that now houses Google, and I ate at La Taza de Oro frequently. I loved it there. 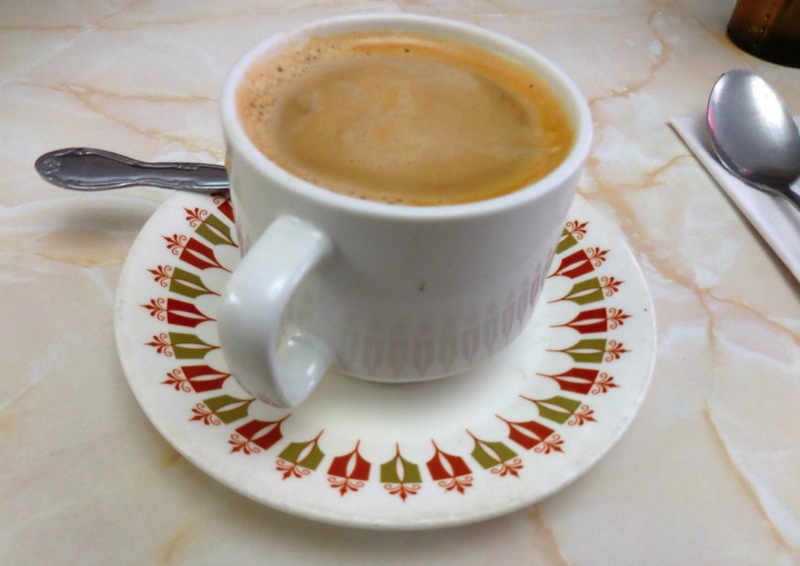 La Taza de Oro was alas considered a safe place as family of its owners for 2 generations. My name is Tony Perez and my cousin Maria Montalvo Inherited the business after both her parents Elizabeth y Alejandro passed. My father Victor would meet his sister Elizabeth ( Titi Eli to us) at the restaurant and we would sit down for some good ole comida criolla. We passed down the traditional n my son's meet me n there cousins at LA Taza. For get togethers. We Celebrated New Years ( the millennium ) and 2010 with our entire family at LA Taza. My heart is heavy with the sadness of it all. But my cousin Maria is tired n can't take the NYC beurocracy. Once the NYC Dept. Of Buildings gets their teeth in you, they won't let go until the have devoured their prey. Nice Going DOB. Another one bites the dust. One little point about Google. One of the things that doubtless hurt LTdO was that Google has company cafeterias that are quite excellent, and on top of it, free. I can understand why Google would want to do have these amenities for their employees, but it's pretty hard for LTdO to compete with. Many hundreds of potential customers were thereby lost. I can't tell you how sad this makes me. Taza de Oro is my platonic ideal for a coffee shop and gathering spot. Sure, there's more than a little nostalgia in there for a place that represents a different time -- and I won't say that that time was more gentle or humane, because it mostly wasn't. But it's more than that. There was a real graciousness of spirit and pride. What other old-school coffee shop makes their own hot sauce and garlic sauce and serves their eggs with a side of avocado without making you pay $10 extra and serves cafe con leche that holds its own against the single-source, shade-grown, fair-trade yuppie stuff. I don't begrudge the Montalvos wanting to hang it up and relax, but Argh, this is just terrible. I too used to work in the now-Google-dominated Port Authority Inland Port No. 2 building (which itself used to reflect the neighborhood, housing offices and light manufacturing). The whole of that neighborhood, around the giant building, is a loss. Jerry's Kitchen, Flanzer Jewelers, Nick's City Kitchen, Doherty's (http://steeber.deviantart.com/art/Doherty-s-2001-199670791), Thai Grill, Chelsea Grill, ...oh it does go on. Regarding Taza d'Oro, I went in once, sat at the counter, was ignored, and never returned. Even that is a proper city memory. Ouch, this one hurts. Sad to hear how La Taza de Oro has passed away. What a wonderful facade and menu. 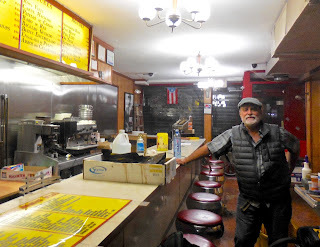 Se nos fue La Taza de Oro en la 8va y la 14, lugar donde tomé café en NY por primera vez en mi primera visita de la ciudad a mediados de los años noventa, junto a Freddie Marrero Alfonso y Mariana Reyes. Allí llegaba el hambre de periodistas, poetas y artistas en fila para el desempleo, así como llegaba el hambre de la farándula millonaria. Si mal no recuerdo, mi última escapada en La Taza fue hace algunos años junto al subcomandante Marco Vinicio Gonzalez. Eric nos dio el tour V.I.P. detrás de la cortina, atendidos como siempre con todos los hierros. so whats for lunch? a starbucks cup & a cookie? a frozen yogart? a cupcake? no wonder they look dazed & confused. I lived around the corner on 15th street for my first year in NYC, fresh out of college in 1980. I think I ate about half of my meals at La Taza del Oro that year. Rice and beans (black beans, gandules, red beans…), tostones with a ladle of garlic oil splashed on top, chuletas, onion steak, pollo of many varieties……..I can smell and taste it now. Probably about 6 bucks then for more food than one person should have shoveled down his throat in a single sitting. Many times back in the day I was the only gringo in the place, much to the amusement of some patrons and guys behind the counter. But, before too long, the countermen got to know me and what I liked to eat. Have eaten there sporadically over the years, and have stopped in many times while in that neck of the woods to pick up a cup of their incomparable rice pudding to go. Another classic lost to a much too rapidly homogenizing NYC. Very sad. Solo quisiera preguntar, quien es el proximo? I went by on Monday to take one last look at the place. Unfortunately, the grate was down so there wasn't much to see except the wonderful old awning. The building looked quite spiffy, all the brickwork newly painted. There was a fellow looking up at it, admiring it as I was. We spoke for a minute or two. Turns out he was the contractor that had fixed the place up. He had a bit more work to do, but was unaware that the restaurant wasn't reopening. This morning, the awning is gone.